While his golf game might be a little on the inconsistent side, Alex Tanguay, who recently celebrated skating in his 1,000 NHL game, can take pride in knowing his hockey career is quite the opposite. A lot has changed for Tanguay since he broke into the NHL as a high draft pick in 1999, from the days of living in his coach’s basement as a rookie, to reaching an impressive personal milestone on March 4. His drive to succeed and his passion for the game, however, is still very much the same. 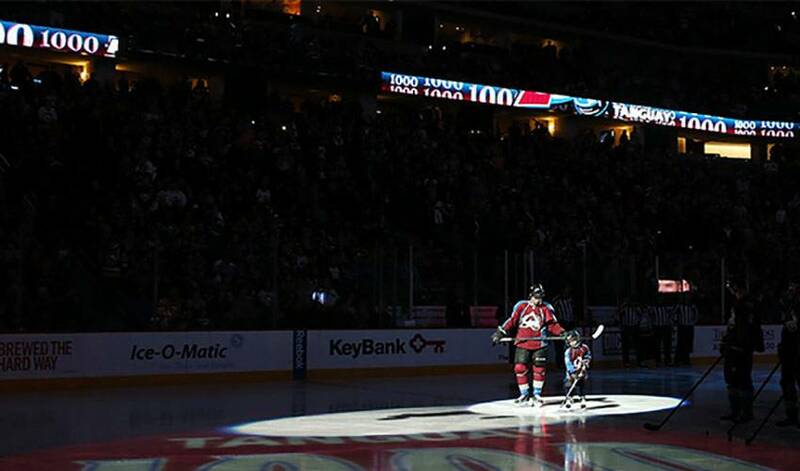 Tanguay became the 299th NHL player to reach the 1,000-game plateau when he recently suited up in a 3-1 win for his Colorado Avalanche over the Pittsburgh Penguins. Not surprisingly, it was a night to reflect, including recollections of his first year in the league, a time when he took up residence in a teammate’s house, someone who just happened to be one of the greatest goaltenders of all-time, and who is now his head coach. “When I made it to Colorado, the team was looking for a billet family for me to stay with in my first year,” recalled Tanguay. “They couldn’t find anyone for me, so Patrick Roy took me under his wing. I lived in his basement for a year and it proved to be a great learning experience for me. He gave me great advice. I would ask him questions and he was always there for me. Now, at the age of 35, Tanguay, who registered his 800th career NHL point in January, is the one who offers mentorship and guidance to younger players. It’s a role he deeply cherishes. A sure sign of the respect he is afforded by his teammates was on display that night of March 4, when Tanguay was honoured before the game with a video tribute, his children and wife by his side on the ice. Taken by Colorado with the 12th selection in the 1998 draft, Tanguay played his first six seasons with Colorado, scoring three points in the Avalanche’s Game 7 Stanley Cup (3-1) championship win over New Jersey in 2001, before suiting up for Calgary, Montreal and Tampa Bay. He returned to Denver last season. That doesn’t always translate to other pursuits, something Tanguay once noted of his success, or at times, struggles, on the links. An apt way to describe the talents of the newest member of the 1,000 games-played club.